In 1970 astronomer Vera C. Rubin (1928–) and physicist W. Kent Ford (1931–) showed that stars in the Andromeda Galaxy were moving so fast that for the stars to stay in the galaxy there had to be a tremendous amount of matter surrounding and enveloping the entire galaxy like a giant cocoon. Because this matter is not visible to telescopes by the light it emits, but rather only by the gravity it exerts, this, too, is an example of evidence for dark matter. After decades of further study, dark matter has now been confirmed as an important constituent of matter around galaxies, in clusters of galaxies, and throughout the universe as a whole. 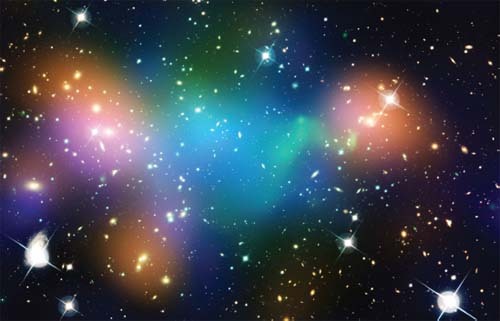 According to the latest measurements, about 85 percent of the matter in the universe is dark matter.